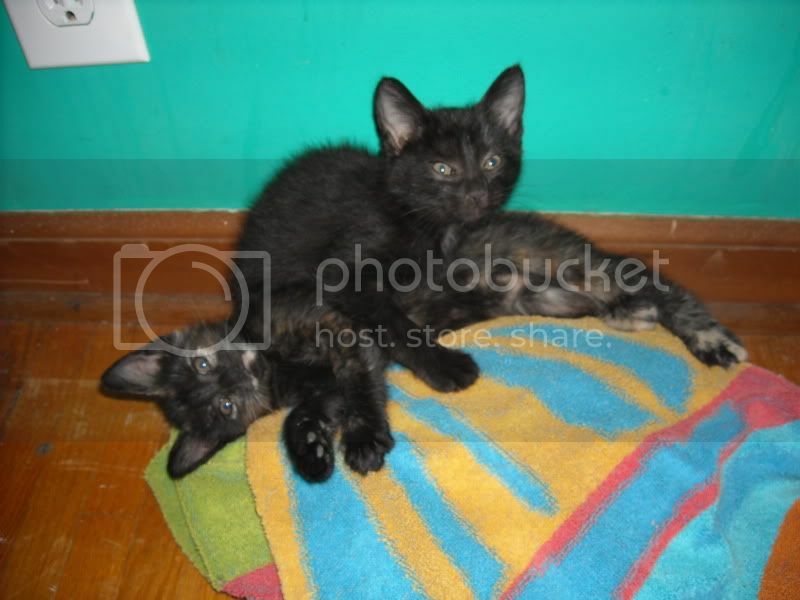 YEStalk Discussion Forums • View topic - New Kitties! My son and friends went for a walk early Saturday morning, and returned with these guys! They've been named Restor the Brave, and Fiona Fudderwagon . . .
Restor is on top, and Fiona is underneath. They're real sweeties! They were abandoned or something? Yeah - apparently were born to one of the outdoor cats that roam the neighborhood - I'm pretty sure "Mom" had just weaned them and went on her way. They were pretty pathetic on Saturday - starving and thirsty, and they're SOOOOO tiny - the vet said they were no more than 5-6 weeks old. So, they've got plenty of water and kitty chow to eat, and I can tell they've grown a bit since Saturday! Restor is a sweetie - he just purrs and purrs and wants to be held. Fiona is the adventurous one - she's a little larger, and is definitely a climber! 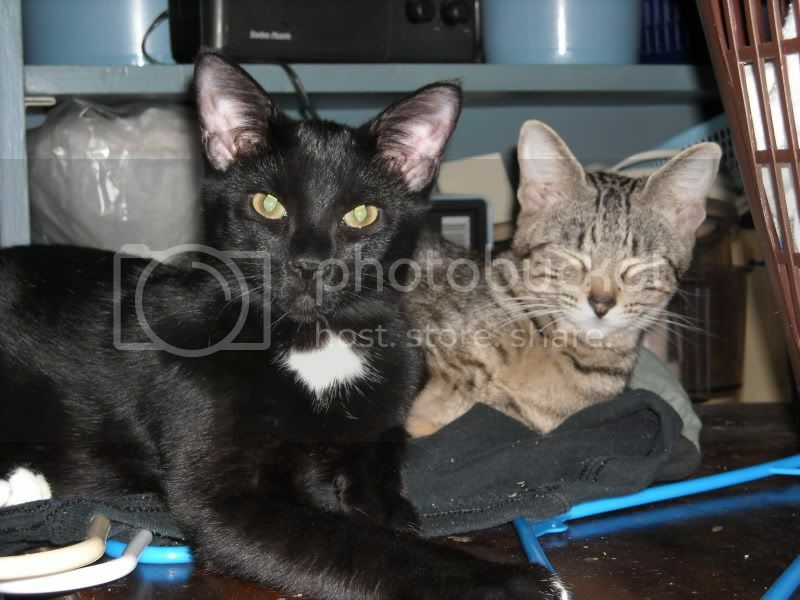 Magus is the black kitty on the left, and Sophia is the striped kitty on the right. Both of them were homeless cats too. Sophia is a sweetie and is taking to the kittens. Magus is a "scaredy cat" and is more tentative, but he'll get used to them too . . .
My own cat died a few months back, at a staggering 18 years old. He was a ginger tom, almost the size of a baby tiger! But I'm sure the average life expectancy is much lower.....? I had a Siamese who lived to be 18. Cats can certainly get that old, and older even, but they don't always. I don't usually choose pets, they just find me when the time is right, it seems. Today, the new kitties have the run of the house with the older ones, as the latch on the bedroom door where we were keeping them isolated is not working properly, and the older cats keep nudging the door open. A good sign, hopefully, that they want to play with the kittens. They were all chasing each other around when I left for work this morning . . . hope they do OK . . . I just came across this. Coincidentally, my cousin also owns a Siamese cat. A wonderful, cuddly creature, I must say.